Access to financial and managerial information to gain understanding, metrics and pinpoint weaknesses or opportunities to improve operations has gained tremendous attention as solution providers flood the market with “user friendly” business intelligence tools. Solution providers position these tools to help “enlighten” businesses enough to purchase their products. However, a software solution is only as good as the implementation process conducted to leverage the full functionality of a BI tool. An underutilized BI tool will frustrate users and will not generate the expected insight demanded by managers at all levels of an organization. Relying on providers to conduct their interpretation of due diligence and discovery could add a level of uncertainty and disconnect that may result in a reporting tool that does not meet expectations. I suggest businesses to review the following framework in identifying their own BI opportunities including the approach and potential benefits from a BI tool as well as defining the key performance indicators (KPIs) and functional group collaboration in developing a library of analytics. The road map for a BI solution, much like any other IT solution, is to start with who has issues that a new solution can address. The who needs to be specifically identified. BI tools are successful in providing insight to operations hence, functional areas or business units. If the BI rollout is the first of its kind for a company, it’s best to focus on functional areas than business units as they tend to perform specific operations and are easier to define, conceptualize and measure. Whereas, business units contain multiple functions and usually involve collaboration with other units and data stores from multiple systems that will increase the complexity of the design and integration requirements. Based on the experience and lessons learned from the initial BI rollout, plan for business unit, cross-function projects as this level is more about decision making and strategy than process improvement. After the functional area(s) have been identified, the next level is to determine who will use or has use for a BI tool. Generally, the lower the job position the greater the need for operational transactional data. As the job position moves up organizationally, the greater the need for summarized information. For example, software consulting firms that derive the majority of its revenues providing services use project managers to mange jobs and oversee staff. Project managers need access to detail information such as staff utilization, budget to actual costs per project and project percentage completions. Upper management will focus more on summarized information such as quarterly performance, which types of projects are generating the most revenue, which project managers are controlling costs and receivables better than others. Companies need to determine which level of the organization will benefit from a BI tool. Basic inquiries should be examined at each level to discover BI opportunities such as what processes are working and which ones are not, where are the bottlenecks in the process, where are most of the costs accumulating and trace back known bad decisions to their sources of data that supported the bad decisions. Determining what information offers the most value is fundamental to the process. This step is crucial to finding value in a BI tool. This step needs to be patiently performed diving into the details asking lots of questions and is best conducted by people with deep understanding of the business who understand process and how those processes interrelate. BI reporting is broken down into three distinct segments of measures, dimensions and level of detail. Measures are the quantifiable values of a business such as total sales and volume of product sold for a given period. Determine what metrics are important to the functional areas that reflect the base processes of those functions. Measures can be broken down into two categories of base measures and calculated measures. Base measures are measures that capture transactional data such as unit sales or customers who bought “x” item(s). Calculated measures are calculated measure such as average gross sales over a period of time or a moving average over a multiple year range. Defining measures need to be relevant to the functional areas. If the functional area is production, measures capturing unit costs, scrap, units produced would be most relevant or if the functional area is HR, measures like employee turnover, absentee activity would be relevant measures. Dimensions describe measures. Reporting on sales measures are meaningless unless their related to categories. For example, saying sales were up without providing a point of reference is not informative and will leave the audience wondering where and when. A common way to describe dimensions is to think of measures by something such as sales by product line, sales by region, sales by quarter and so on. Consider what dimensions are critical and then associate measures to them. Each functional area has their unique dimensions. Take the time to identify all potential dimensions. Setting up group sessions to brainstorm ideas is very effective in generating ideas and helps foster a team approach to solving problems. These groups should consist of people, as mentioned previous, who fully understand the business and functional area operations and who rely on comprehensive information for decision making. There is a tendency to think of a BI implementation as a technical experiment because of the level of technology used. This approach is fatally flawed as the point of any reporting tool is to provide people with relevant and reliable information in making informed decisions. Identifying measures and dimensions is a business exercise to gain insight into the business to look for opportunities to improve to pinpoint inefficiencies and to spot trends both positive and negative. Therefore, business questions need to be asked such as what are the margins for a particular product line? What is the ratio of won deals to lost deals for a particular sale rep? How has our cost of sales changed as a percentage of revenue since our major suppliers increased their prices? With the new assembly machines, how has production and scrap waste improved? Once the list of business questions has been documented, translating them into measures and dimensions is relatively easy. Depending on the completeness of the business questions, a library of measures and dimensions will develop. It might be surprising how creative business questions will surface more measures and dimensions then thought possible. Don’t dismiss any metric as irrelevant as they might lead to new measures and dimensions that might not have been thought of without making that left turn. The preliminary list of measures and dimensions should be documented in a spreadsheet so to allow the ability to rank and sort each combination as each metric is reviewed and prioritized. Once the combinations of measures and dimensions have been identified, the next step is to screen them and grade their plausibility. At this point, its time to bring in the technical team to transition theoretical wants to practical terms as some metrics may not be programmatically possible. For example, is there data to support the proposed measures and dimensions? Can data from different sources be joined where a single data source does not contain the necessary fields for the measures and dimensions? What level of detail is required by each level of user as this will affect processing time in querying the data? Grading the library of metrics for a given functional area should be based on the degree the library is actionable, materially impacting and whether the metric is tactical or strategic. Actionable is determining if the BI tool will prompt an immediate action to address a situation or correct inefficiencies. Based on being actionable, will the BI tool generate a material impact if actions are preformed from the information provided by the BI tool and finally will the BI tool impact short term operation results or generate competitive advantage for strategic planning. As the library of measures and dimensions were listed in a spreadsheet, the three criteria as well should be entered into a spreadsheet to facilitate grading. List the criteria across the columns with the functional areas on the rows and apply a high, low, strategic and tactical to each applicable column. Depending on the outcome of this grading, the proposed BI tool may or may not generate the expected value. If not, additional brainstorming sessions can be held with a new set of participates with a fresh point of view or the initiative can be canceled if the stakeholders warrant it. Measuring the value of BI opportunities using traditional financial measures like ROI, payback period and discounted cash flows is difficult. 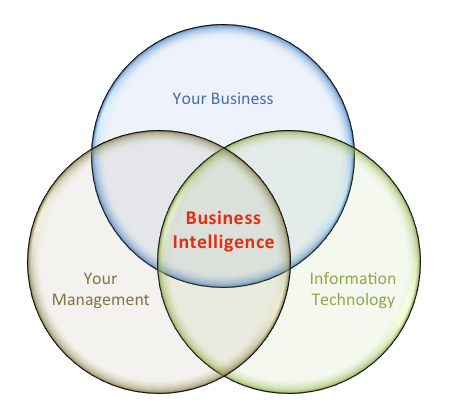 Business intelligence is more intuitive than quantifiable where value is derived from having information quickly, the quality of decisions from using BI reporting and insight into the business for strategic planning. However, if measurable benefits must be a known quantity then a case can be made that BI tools save time in producing reports, improve operating efficiencies from access to specific information, lower capital expenditures from process improvements and improve customer service based on actionable information. From a project cost perspective, BI projects commonly include hard costs such as hardware, software, maintenance costs and development costs both internal and external. As previously stated, if the BI initiative is new to a company, limiting rollout to specific functional areas in great need of improvement, visibility and insight is an intelligent way of entering the information age.